Pete Bigelow covers mobility issues for Automotive News. There's a distracted driver alongside me in the eastbound lanes of M-14 in suburban Detroit on a morning late last week. She's drifting out of her lane while staring at the cell phone in her hand, oblivious to the urgent matter at hand. I'm irritated and annoyed. A quick honk, and her attention is back where it belongs. Thirty seconds later, I'm reaching for my phone to change the song on Spotify. I had briefly joined the ranks of the distracted masses, and become a hypocrite to boot. But I'm not alone. Eighty-five percent of respondents to a new survey on smartphone usage behind the wheel identify distraction as "a very important problem." Yet 47 percent of the same respondents admit to using their devices while driving so often they fall into a category of motorists called "Phone Addicts." The term and survey come from Zendrive, an analytics company that has collected more than 160 billion miles worth of behavioral driving data from smartphones. Information from that data capture and the driver survey informed the company's third annual Distracted Driving report, which was released this week, and it delivers a harrowing snapshot of the addled state of U.S. drivers. Most alarming is the rise in what Zendrive calls "phone addicts," those drivers who spent 10 percent or more of their time behind the wheel looking at their smartphones. That segment of drivers almost doubled, from 4.6 of the overall driving population a year earlier to 8 percent in 2018. Phone addicts pick up their devices 4.3 times more than the ordinary distracted driver, according to the report, and they use their phones an average of 28 percent of time they spend behind the wheel. As the distracted-driving epidemic worsens, Zendrive says as much as 20 percent of the driving population could be classified as phone addicts by 2022. "You have younger people on the road, and the smartphone is at the center of our universe," Jonathan Matus, co-founder and CEO at Zendrive, said in an interview. "We're dependent on this device for work, personal [connections] and entertainment, and what you are seeing is an implication of that trend." Cellphone addled drivers are 9 percent slower in braking, Zendrive says, putting smartphone distraction on par with a 0.08 blood-alcohol content level. The report contends that phone addicts are an even greater threat than drunken drivers, because more of them are on the road, and they're driving between 7 a.m. and 6 p.m., when they are a threat to the greatest number of fellow motorists. In 2017, the latest year for NHTSA has full data, alcohol-impaired drivers were involved in crashes that killed 10,874 people or 29 percent of U.S. traffic deaths. A research note published this month by NHTSA concludes that 9 percent of fatal crashes involved distractions of all kinds, and that a total of 434 people died in fatal crashes that specifically involved cellphone-related activities in 2017, roughly 1.1 percent. 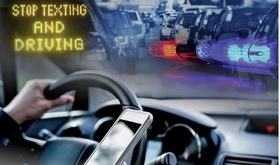 Safety advocates say NHTSA's methodology undercounts distracted-driving crashes. Drivers typically don't admit to cellphone usage, and forensic technology used for investigations is often too costly or unavailable for all but the most severe of crashes, which is why Zendrive's data helps clarify the prevalence of distraction. While the devastating consequences of drinking and driving have been clear for decades, the ramifications of distracted driving are still emerging. That discrepancy should be a call for action, Matus says. "What we're trying to do here is bridge the gap between how society is strict and firm and adequately restricting driving under the influence of alcohol with how society is lenient, flexible and forgiving on the issue of distraction," he said. Social norms and legal implications may catch up to the problem over time. But we collectively don't need to wait before taking corrective actions. Zendrive suggests using the "Do Not Disturb" feature on all iPhones while driving, and has started a #TextYouLater social media hashtag to raise awareness of the issue. It's a good start. But when it comes to using a smartphone behind the wheel, the simple fact is I know better. So do you.